There's an oil price trend that's giving some oil refining companies a huge competitive edge. Specifically I'm referring to Marathon Petroleum Corp. (NYSE: MPC). Currently, there aren't many ways to ship oil out of the basin, and supply in the region is outpacing refining capacity. 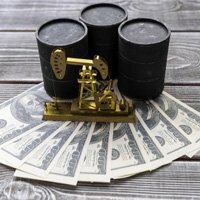 That's helped keep the price of West Texas Intermediate (WTI) crude lower than the price of Brent crude in London, with the spread now around $17. Ohio-based Marathon Petroleum Corp. was formed July 1, 2011 when Marathon Oil Corp. (NYSE: MRO) spun off its highly profitable refinery and gas station business. It's the fifth largest petroleum refiner in the United States, with its six refineries offering a combined capacity of 1,142,000 barrels of oil per day. Gary R. Heminger, Marathon's new chief executive officer, said his company has built a strong enough refining position in the Midwest to ward off competition. He doesn't expect new pipelines and rail yard capacity bringing oil from the Bakken to the Gulf Coast to soften his competitive edge. The oil still needs a high-volume consumer and his refineries are the most obvious choice. Marathon also will profit from its operations beyond the Midwest. It's negotiating with pipeline companies to use its Texas refinery to process more crude from the new Eagle Ford Shale. The new Eagle Ford is unconventional shale oil that's extremely light, and can be mixed with another cheap blend – a heavy, sour crude – to make a more expensive finished product. Marathon's Detroit refinery is undergoing a $2.2 billion overhaul that'll let it process heavy Canadian crude, which currently is priced even cheaper than WTI. Marathon also has a profitable retail footprint. It operates 5,100 Marathon-branded gas stations in 18 states and 1,350 Speedway-branded convenience stores in seven states. It has more than 9,600 miles of pipelines into and out of its facilities. The new refining company has a market cap of $13.3 billion with an enterprise value of $14.6 billion once net cash and debt is taken into consideration. The company reported $66.8 billion in revenue over the last trailing 12 months. Third quarter earnings released Nov. 1 showed a 309% increase in net income from 2010's third quarter to $1.13 billion. Earnings per diluted share rose to $3.16 from $0.77 last year. Marathon also announced Oct. 26 a 25% dividend increase, for a yield of 2.6%. The company has historical price/earnings (P/E) ratio of 7.2 over the last 12 months with an estimated forward P/E ratio of 5.6. Its stock has soared more than 17% in the past month, closing yesterday (Wednesday) at $37.02. Action to Take: Buy Marathon Petroleum Corp. (NYSE: MPC) (**). It's time to buy Marathon Petroleum Corp. as it positions itself to profit from low input costs and high refining capacity. I would buy half of our position now at market price, with an eye toward selling naked puts contracts for the other half of the position. This would give you a chance to be exposed to the upside move while increasing the overall cash yield on your first-half position. (**) Special Note of Disclosure: Jack Barnes has no interest in Marathon Petroleum Corporation. (NYSE: MPC). Barnes retired to the beach in the summer of 2009, and continues to write from there. He's now the author of the popular blog, "Confessions of a Macro Contrarian," and his "Buy, Sell or Hold" column appears in Money Morning on Mondays. In his BSH column last week, Barnes analyzedNiska Gas Storage Partners LLC (NYSE: NKA). I guess that is one of the issues that has come up over the years. What type of crude is coming from North Dakota and is it the same as to the north in Canada? Here you say light sweet crude in your article. The tarsands crude in Canada is to be considered the bottom of the barrel,so to speak by some. Then as you look for ways to ship it to refineries does it get mixed in with lower quality crude. You have to keep in mind when and where refined and EPA standards. For example: Several years ago there was a pipe line in Arizona broke down. It was down for several weeks and North Dakota could not truck refined fuel down there due to the EPA ratins that were different and they were also mentioning it had troubles iwth the interstate commerce clause in the U.S. Constitution. Jut food for thought. ND Bakken oil is truely light sweet crude – most of it is one or two grades ABOVE WTI. It definitely commands a premium to the oil sands crude from Canada. BTW – article is just a bit out of date and EIA is probably a very poor source for current production numbers… ND/Montana Bakken + Three Forks production hit 464,000 barrels per day in September (and it is definitely not 2035 yet) – 2011 exit rate will almost certainly be north of 500,000 barrels per day. Look for over 1,000,000 barrels per day by 2017.